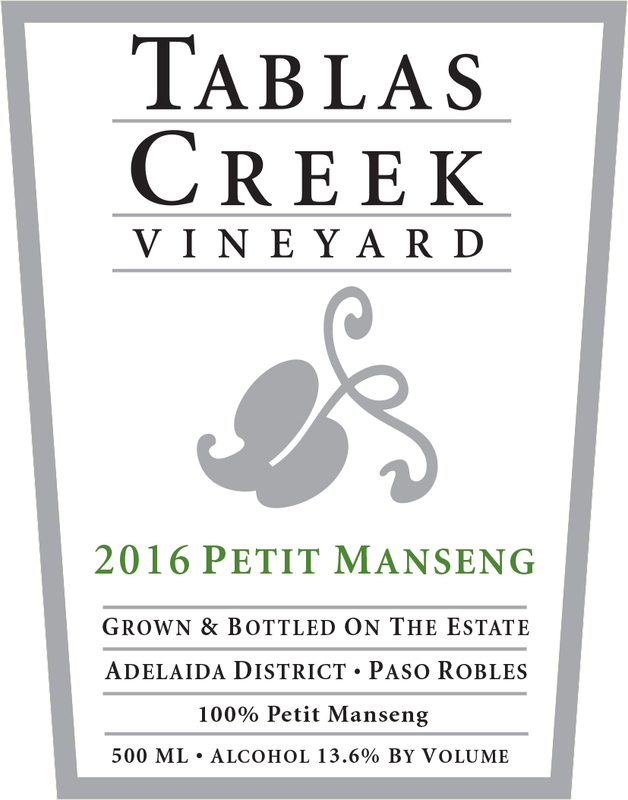 The 2016 Tablas Creek Vineyard Petit Manseng is Tablas Creek’s seventh bottling of this traditional grape from southwest France. Petit Manseng is best known from the appellation of Jurancon, where it has made admired but not widely disseminated sweet wines for centuries. Petit Manseng achieves sufficient concentration and sugar content -- and maintains its acids sufficiently -- to make naturally sweet, balanced wines without botrytis. This character was so valued that Petit Manseng is noted as the only wine to have been used to baptize a king of France: Henry IV, the founder of the Bourbon dynasty, in his native Navarre. The 2016 Petit Manseng is bright and mineral on the nose, with aromas of key lime, lychee, chalk, and tarragon. On the palate, sweet but with bracing acidity too: flavors of candied grapefruit, nectarine, and spun sugar, with a citrus pith bite cleaning up the long, appealingly sweet-tangy finish. We expect it to age beautifully. We imported Petit Manseng in 2003 in the hopes of making a naturally sweet wine. The vines were released to us in 2006, and our first small vineyard block was planted in 2007. Over time, we have come to the conclusion that Petit Manseng is best used for off-dry wines: wines with residual sugar but less than our sweet Vin de Paille wines, with the grape's notably bright acids providing balance. Our Petit Manseng grapes were grown on our certified organic estate vineyard. Our Petit Manseng was harvested in one day on September 15th at 26.8° Brix and a pH of 2.99. We fermented it in barrel, and stopped its fermentation when it had about 57.8 grams/liter of sugar left and sat at an alcohol of 13.6%. The high acidity makes it taste much drier than the sugar reading would suggest. The wine was aged on its lees in barrel and bottled in July, 2017.